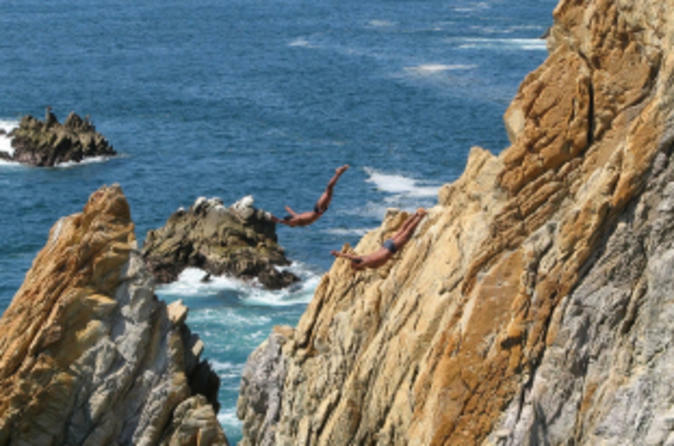 While you’re in port in Acapulco, don’t miss its biggest claim-to-fame, the Quebrada cliff-divers! No visitor to Acapulco should get back on a cruise ship without a shore excursion to the elegant La Perla restaurant, where celebrities used to hob nob and world-famous daredevils still dive off La Quebrada cliffs every night. Your visit includes a three-course dinner. Your exciting Acapulco evening shore excursion takes place at La Perla restaurant, which overlooks the cliffs from where the daring cliff-divers of Acapulco risk their lives every night. La Perla used to be a hotspot for Hollywood stars of the 50s and 60s vacationing in Mexico and is still a beautiful, sophisticated restaurant today. The cliff-divers climb to a height of more than 90 feet (30 meters) on La Quebrada cliffs, pray at the altar of the Virgin of Guadeloupe and dive off the cliff at the precise moment when the tide brings in the large waves! It’s the perfect accompaniment to your three-course dinner. This shore excursion is only available if your cruise ship departs Acapulco at midnight. Please check your cruise schedule prior to booking.